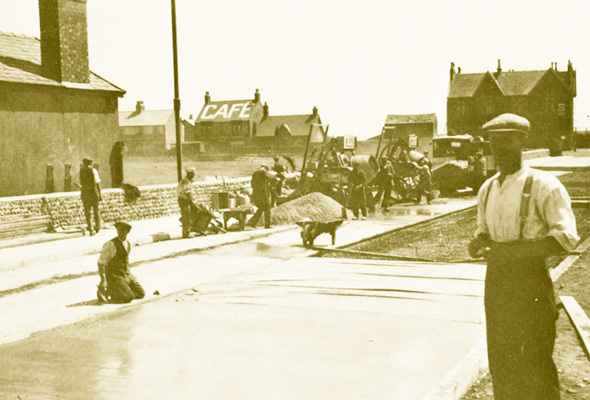 This postcard from 1925 is of great interest as it shows workmen making the first concrete road in Fleetwood. Known originally as Cemetery Road because it skirted the town’s burial ground which was laid out in 1840, the name was changed to Beach Road. In the background can be seen the Queen’s Hotel, a cafe which was later demolished and part of the old cobble wall from Warren Farm. Although the farm was knocked down and Shakespeare Road Housing Estate built upon its land, most of this wall remained, perhaps because it was so strongly built it was hard to get rid of. Old residents remembered a character who used to sell parched peas every Sunday afternoon by the gates of Warren Farm. 1929 saw a great outlay in the construction of Broadway e.g. Rainford Potteries and Alex Keay’s Sawmills – fencing timber, also salt-glazed pipes, and on January 10th ‘re-enforced steel for Broadway’. The asphalt surfacing was ordered for March 20th 1929. Hi the cafe in the background is my house now. I would really appreciate an help to find a good photo from back in the days as I’ve looked for years and never found anything.